It’s been a crazy year. Will is now 4, and while things were nutty during the infancy months, things seem even more hectic now that the boy continues to grow as a preschooler! Amy and I each took Will out at different times to have him help us pick out items for him to give us. 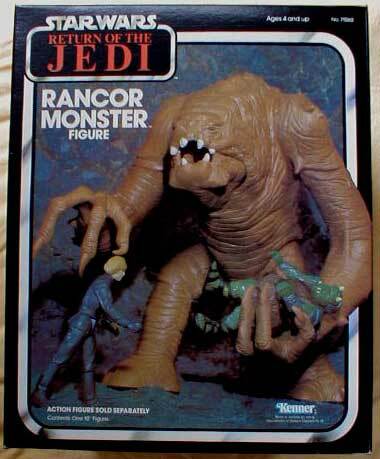 Sadly, on Christmas morning, all he did was want to open anything with his name on it. And with a look of delirium in his eye, he just couldn’t understand the idea that a present that says “From Will” wasn’t actually FOR him… even if he’d helped pick it out for us. (Next year, I’ll have him be a part of wrapping it and maybe we’ll use exclusive paper for his gifts to us). I ended up opening all of the gifts he and Amy picked out for me quietly while he harassed his little cousin. Oh well… next year perhaps! 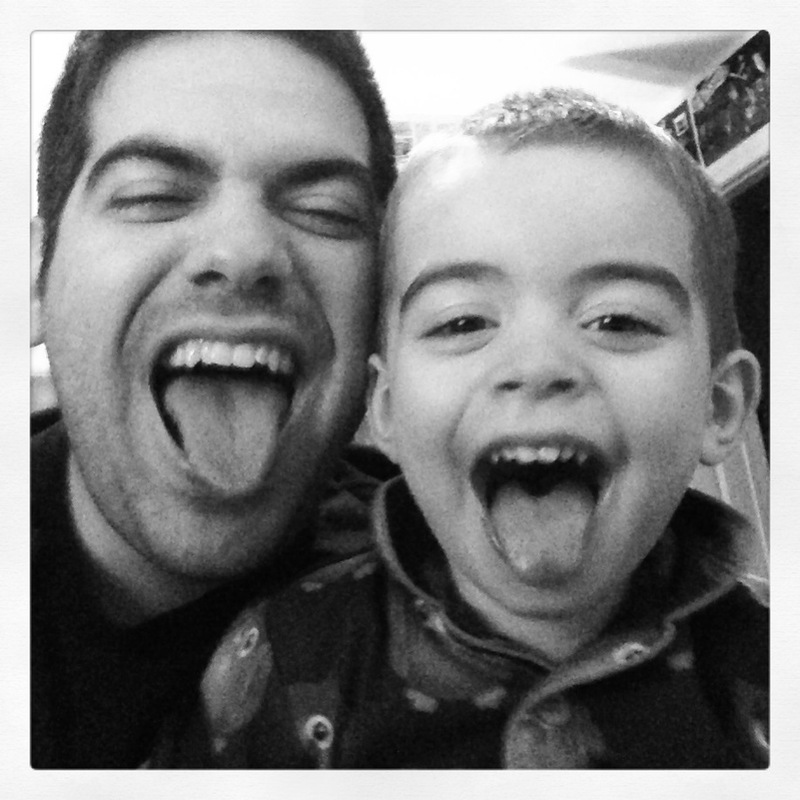 April 15, 2014 Journal Entry – "To Spin or Not To Spin"
Over the weekend, Will got violently ill, waking up in the middle of the night, puking all over his crib. Amy spent most of the next 36 or so hours by his side, even sleeping with him on the couch the next night. Two nights later, Amy and I were struck with apparently the same sickness at virtually the same time, and we ended up being sidelined for a full day. Thankfully, her parents took Will for almost 2 days so we could recover. 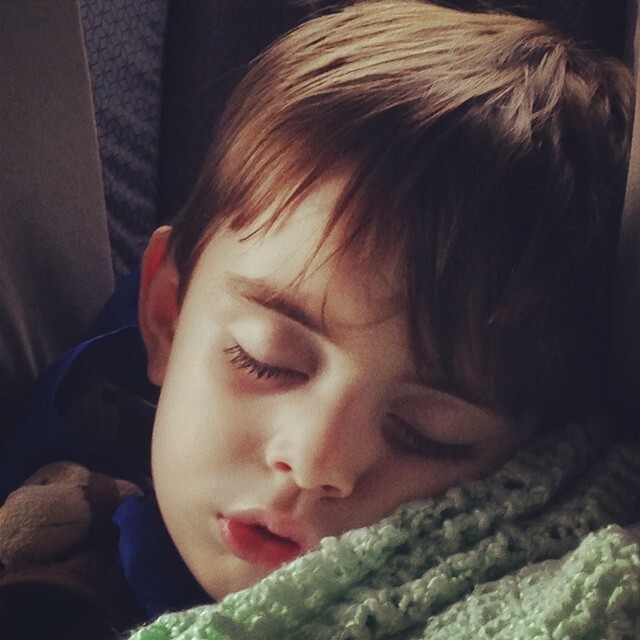 Tonight, Will was back home and slowly recovering from a nap in the car ride home from his grandparents. He was coughing and gagging a lot, but seemed fine for the most part. I was trying to get some work done in my office when a finally smiley Will came running in. So I start spinning him in my chair. The sound of a microwave chiming yanks him out of my office and back downstairs, and so I resume working. But before long, I hear the pitter patter of little hands and feet coming back up the stairs. And, before long, he’s wedging himself between me and my keyboard to get me to spin him in my chair. So I heed the Ghost of Christmas Future’s warning and get up to spin Will in my chair. Except… he seems to never want me to stop. Finally, I tell him to sit tight for one last spin. But this time, when I stopped it, he gags and puts his hand to his mouth. With sparing you the gory details, he vomited all over my chair (which has a porous “pattern” on a vinyl surface, mind you). As I stand there in shock, not knowing what to do with my puke-covered child or chair, and with Amy otherwise occupied in the bathroom downstairs, I grabbed my son–who’s now complaining about the smell–and dumped him off in the upstairs bathroom where he was about to have a bath anyway, just as Amy was coming up the stairs, and proceeded to try to salvage what I fear is a doomed desk chair. Most “bed times” consist of Amy marching Will into his room, brushing his teeth, reading him a story, etc. and then they both call for me to come into his room for prayer time. Tonight went a little different. Amy starts it and Will says it with her. March 20, 2014 Journal Entry – "It's SPOOOOOKY!" Most nights when Will goes to sleep, I leave his room to finish work in my office next door, or retreat to my mancave in the basement for some much needed downtime. Often times, Amy will fall asleep in Will’s room while reading him a story or because she’s just too tired to get out of the room (she actually has a sleeping disorder called “narcolepsy” which doesn’t help). Last night, Amy and I left his room and I went into the office and she went to sleep for the night. But most nights, she keeps Will’s baby video monitor by her side so she can be up and at his aid in a heartbeat. This time, she forgot it though. We’d just got done re-watching Frozen not long before bedtime, and he’s genuinely frightened of the snow beast in the movie. Oddly enough, he likes it and is terrified of it at the same time. (He even stomped around the room and pretended to BE it). After several instances of “It’s SPOOOO-KEEE!”, I went in his room and asked him what was wrong. He repeated that it was spooky, so I rubbed his back and asked what was spooky. I asked if it was the snow monster and he said yes, but then said something about a big bug. Maybe he had a nightmare, maybe it’s just his imagination, but I have no idea what big bug could be vexing the poor little guy. So I assured him we’re here to keep him safe and that he can go back to sleep. I closed the door to his room and I hear him repeat that it’s spooky, so I opened his door and looked at him and he smiled. OK, I guess he’s just having fun with me. I repeated that little exercise (opening the door to him saying it was spooky again) a couple times and then said “Goodnight” and closed the door. I returned to my desk and then heard him talking to himself. This time, it quickly escalated into soft sobs and whimpering and calling for “Mommy”. I popped up off my chair and opened the door and he sat up clutching his blankets to his mouth and sort of rocking back and forth a little bit. I asked him what was wrong and he wouldn’t speak. So I did what any clueless parent might do… I asked if he’d like me to read him a story. He quickly said “Yes” and laid back down, so I went over to his book shelf and rummaged through the collection. “No… nah… nope…” None of them sounded interesting… to me. 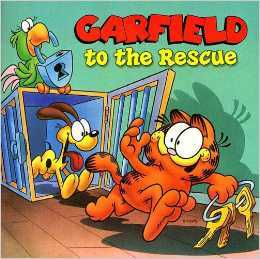 Then I found a Garfield book. Eureka! Something I was given to by a college friend who knew I was a big Garfield buff. A hero story? Perfect! So I start reading this thing to him… and it turns out to be about this guy called “The Petman” who kidnaps pets and cages them up in a warehouse… and he has a big menacing Doberman dog to guard the place. What the heck did I pick? I ended up trying to read it with a lightness in my voice that the story didn’t offer, and changed words like “menacing” and “Doberman” to “ugly” and “dog”. Will didn’t react to it at all, actually, so I assumed the story still went over surprisingly well. 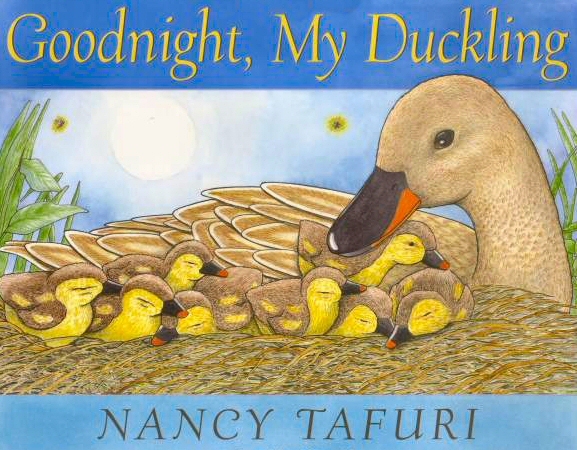 After it was over, I offered to read one more story, and grabbed the far lighter “Goodnight, Duckling.” He sat up to look at the board book pages and excitedly followed along with the simplistic (and so simple it was almost insulting) book that he seemed to have (easily) memorized. After it was over (which was in about 5 seconds), I assured him that we were here in the house to keep him safe and I’d be next door in the office if he needed me. He then laid back down and soon fell asleep. While I feel bad for the little guy for having a rough night (after what was a rough day), it was heartwarming to get to share these moments with him. October 14, 2013 Entry: Will The Wannabe Concert Photographer? Tonight the three of us attended a Plumb concert in York, PA at a place called Church of the Open Door. We’ve taken Will to a few shows in his short life, even since before he’d been born (but apparently when the fetus could already start hearing), but it’s been a few months now since we last took him to a concert. He recently turned 3 years old. If my memory serves me right, the last show we took him to was in March of this year and he really seemed to have a lot of fun, getting into the rock music by dancing near the stage. Tonight, Will started to follow me wherever I went. This meant that when I snuck up front and knelt off to the side in front of the front row, Will followed me… and followed my lead as well. He ended up dumping himself at my feet and sat right down, feet straightened out across the floor in front of me, with his eyes fixed on the band on stage, and then back at the large magical lens I wieled in my hands. He seemed super excited to be up there with me. Soon he was trying to see inside of the lens to find out how it exactly worked, but I had to continue doing what I was doing. Will’s presence seemed to go unnoticed by Plumb herself, but I noticed that the drummer seemed to find it a little amusing, as did some of those in attendance around me. I was a little self-conscious about the attention I was attracting by having my little partner-in-crime in tow, but it didn’t seem to annoy anyone so I tried to get what I needed and pull him back from the frontlines. The later instances didn’t go quite as well. Will proceeded to follow me like a puppy around the venue. At one point, I asked him to stay with Amy and I went up to get some shots from the other side of the stage and then came back past the seats a to where I left them. Will was a basket case. He looked at me with tears streaming down his face with a hand outstretched in my direction muttering either “Daddy Wait for me!” or “Daddy come back!” (or both?) It was heartbreaking, and the look of helplessness on Amy’s face made it worse. She wanted to keep him out of the way too, but didn’t know what to do. And how do you tell a 3 year old that what you’re doing is allowed and needing to be kept inconspicuous and the toddler isn’t allowed to come along? Later, I sneaked away from Will and Amy to do some more shooting and it seemed to work nicely. However, when the music stopped between songs, I recognized a familiar voice crying out “Daddy! Daddy!! !” Yikes. It was indeed Will. If I had to be completely honest, I’d say that as much as I absolutely love taking photos at shows (and I do), it can sometimes get lonely. I think, if you’re doing it right, you’re up there needing to do your job and you need to worry about staying out of people’s line of sight as much as possible. You’re meant to be invisible and to get what you need and do it without becoming a hassle. In other words, you’re better off not being remembered for ever being there than being remembered for being “that guy with his camera who got in the way” or worse yet, “…had to be told to move/sit down/leave/stop doing that,” etc. So, depending on how much the job can separate you from a fellow concert-going partner, or if you end up attending a show alone, you’re going to be spending some serious time alone around people who don’t particularly want you there. As much as I’ve been waiting 9 years to see Plumb again and as much as I loved her seeing her live again, my favorite moment of the night was my son sitting at my feet as I performed my photographic duties. And I wish I had a picture of that. Our son Will is now 2 years and 9 months old. In recent months, his language development has accelerated considerably, which has been exciting for my wife and I to watch. He frequently surprises us with random movie quotes or repeating things we say… which brings no shortage of amusement to us. This summer we’ve even taken him to the movie theater twice, too. His first movie experience was the re-release of Finding Nemo late last year, but even at 2 years old, he didn’t really seem to take in what was happening. But he did mostly stare at the gigantic screen the entire time. 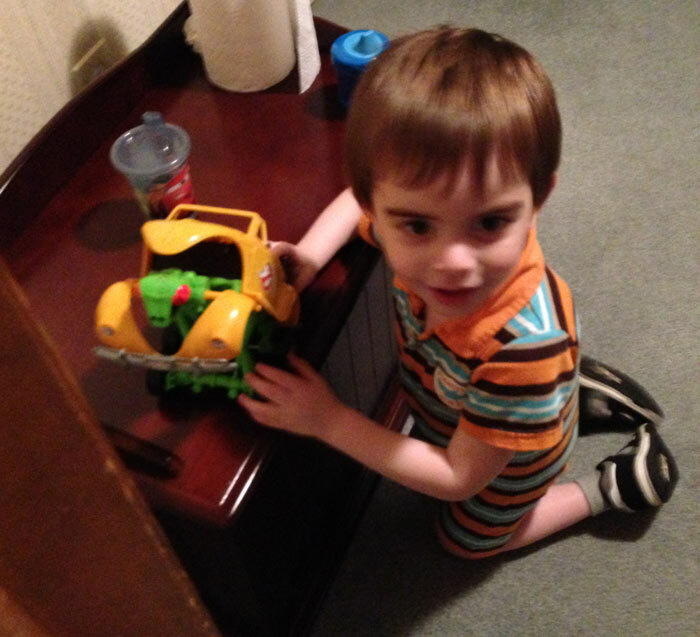 In recent months, we were shocked to find that he absolutely LOVES Monsters, Inc. – the original. I expected it to terrify him, so I didn’t show it to him for quite a while, but when I showed him part of it, because it contained a scene that involved a toy he loves, he just loved the film. So we took him to see Monsters University which he seemed to really enjoy. (Our theater lets kids in free under 3! Woohoo! 🙂 ) We sat off to the side in a section by ourselves and tried to keep him as quiet as possible. He couldn’t resist roaring along with the characters a few times though. Then, recently I showed him Despicable Me, thinking “if he can handle Monsters and The Incredibles, this kid can handle the escapades of Gru and his minions.” Sure enough, because this kid is absolutely, positively infatuated with the moon, he loved Despicable Me — especially the scenes involving the moon and rockets. (I tell you, this kid is instinctively nerdy and in love with sci-fi). So we took him to see Despicable Me 2 last week, and he was already getting excited about the concept of ‘going to the movies.’ He clapped a couple times during the movie, although sitting for an hour and a half was a little daunting for him. As we left the theater, he saw a motion poster that displayed the preview for Planes and he excitedly pointed to the poster and exclaimed “Movie!! Movie! !” The apple does not fall too far from the tree. Last night, we took him to a family party that took place partially outside in a beautifully landscaped backyard. He was playing a little with his second cousins, who were all older than him, and when the fireflies started coming out — and those and mosquitoes decided to interact with him — he looked upset and asked to go inside. While the other kids didn’t seem to mind the bugs much, it was pretty funny to me to hear my son speaking my thoughts on insects (although, granted, I was more outdoorsy as a little kid than I am now as an adult. I’ll take AC and a pad and pencil over a ball and 90 degree heat any day of the week). One of my favorite experiences with him lately, however, was taking him to my parents house to dig out some of my old toys. My dad and I went up into his garage attic and brought down boxes and boxes of my brother’s and my old 80s toys — Transformers, LEGOs, PlayDoh, The Real Ghostbusters, G.I. Joe. Will kept grabbing whatever looked cool to him and running into the other room to claim them as his own (I had to keep saying, “No Will! That’s Uncle Joe’s!” I mean, c’mon… the original Galvatron? I was tempted to grab it for myself!). For me, it was a trip down memory lane, and fun to see Will interact with things I spent many a happy hour playing with. 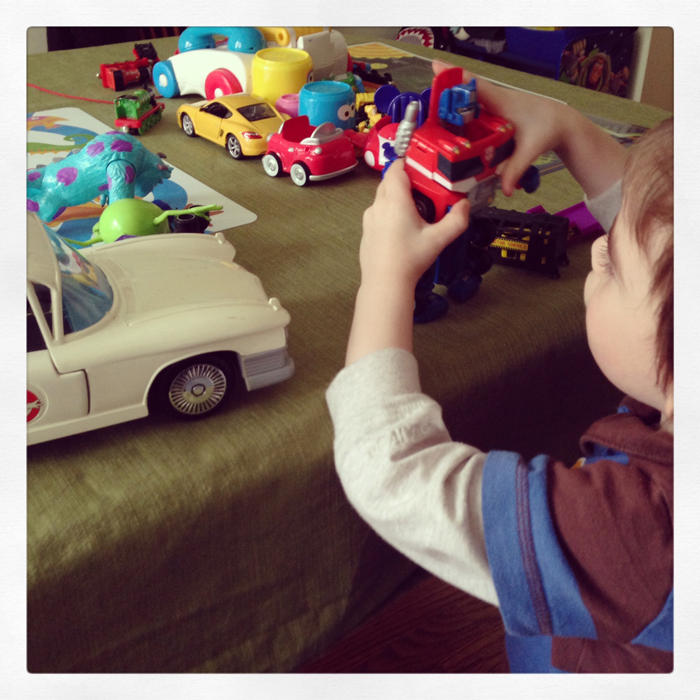 I boxed up some of the best stuff and took it home with me for when he’s old enough, but Will claimed for himself my Real Ghostbusters Highway Haunter – a Volkswagen beetle that literally turns into a bug. It’s pretty cool and I can see why he loves it so much. In fact, recently I’d snagged the Real Ghostbusters Ecto 1 car on eBay for him and it’s quickly become one of his favorite toys. It’s crazy, too, because the only association he has for things like Ecto 1 is that his dad loves it. It’s been a few months since I last wrote, but things have been far from uneventful. Will’s still growing and changing pretty much daily and the things that he says make us laugh all the time. It’s intriguing to note how much we often have to ‘roll with the punches,’ so to speak, and adapt to his changing. Just last night when the three of us were out to eat, he threw a tantrum at our booth in a restaurant and we still are not quite sure what it was about. But once he got his meal and started chowing down, all seemed right with the universe. But he’s definitely more of a parrot at times now. He’ll surprise us by mimicking (or MOCKING!) things we say. Will is 2 and a half years old now and we’re definitely seeing the development of his personality speeding up. He’s showing signs of imagining when he plays with his trains and other toys – we’ve even caught him sort of joking around. It’s amazing to me. It’s also funny how one day he’ll be all about one thing and the next day, he’ll be all about another. But lately, one thing he’s consistently obsessed with is – the moon, of all things. There’s a Mickey Mouse Clubhouse episode where they all go into space and it’s really piqued his interest in planets and rockets. It’s kind of funny. [I can’t help but assume he’s going to LOVE Star Wars). Will’s speech and comprehension of seemingly random things keeps amping up. Just the other night, we were out at a diner and he was holding a toy and suddenly raised it in the air and declared “Up!” And put it down and proclaimed, “Down!” And, I forget what the objects were (butter packets? ), but he literally counted out the quantity of them on the table (2 or 3), which was cool because I know he can count from 1 to 20, but it’s exciting to see he understands –at least somewhat– how counting works! Even as I write this, we are watching classic Donald Duck cartoons and when one ended, he ran up to me and said “More peez!” (and he just a second ago did the sign language sign for “more” while saying it — but the attempt at “please” is a new thing. This was fascinating to me too: I hung up a piece of art I bought recently on eBay in my office yesterday and had to take down a different framed photo. I left it on a desk near the doorway and he saw it today and said “book!” and I said, “No, Will, it’s not a book, it’s actually a picture! It’s a photograph!” He then tried to open it, but then abandoned that when I emphasized it was a picture and proceeded to prop it up on a CD rack nearby and walk away…! That was definitely a first that I’ve seen. It’s really quite neat to witness his various developments!